Discover Roberta Mameli (Zelmira) and Christian Senn (Idreno) in the concert version of Haydn’s Armida at Schloss Esterhazy in Eisenstadt. They will be accompanied on the occasion by the Haydn Philharmonie conducted by Enrico Onofri. Welcome on board ARIANNA VENDITELLI! We are excited to announce that the young, talented & charismatic Soprano Arianna Vendittelli just joined our worldwide artist roster! Five of our Artists take part in Rossini’s Barbiere di Siviglia at the Cultural Centre of Lugano. Conducted by Diego Fasolis it features Riccardo Novaro as Bartolo, Lucia Cirillo as Rosina, Giorgio Caoduro as Figaro and Ugo Guagliardo as Basilio. Sonia performs Hasse’s Serenata Marc’Antoine e Cleopatra at the Kultur- und Kongresszentrum Liederhalle with the Stuttgarter Kammerorchester under the baton of Reinhard Goebel. Roberta and Sonia are involved in the production of Semele by Johann Adolf Hasse. Karina is Merab in Handel’s Saul at the Glyndebourne Festival. Maestro De Marchi, Artistic Director of the Innsbruck Festival, conducts Didone abbandonata by Mercadante featuring Carlo Allemano as Jarba. He appears in the role of Don Bartolo in Rossini’s Barbiere di Siviglia at the Chorégies d’Orange Festival. 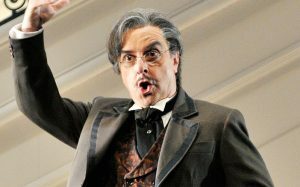 Giorgio is Enrico in Donizetti’s Lucia di Lammermoor at the Sydney Opera House. During the Salzburg Festival, Giulia performs the part of Salomè in the Oratorio San Giovanni Battista by Alessandro Stradella with the Collegium 1704 conducted by Václav Luks.